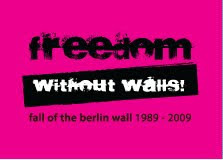 There's a big glossy campaign going on now from Germany celebrating the anniversary of the fall of the Berlin wall, called "Freedom without Walls". The Department of German at the University of Wisconsin has put up a huge poster on a big frame and there's a pile of trinkets, all in this garish pink and black (from here). I thought it was some brutal political joke until I realized that the 'Made in China' was on the plastic wrapper. It makes perfect sense, glorifying the triumph of capitalism from Eastern Europe to East Asia. "Ink pen"? May we deduce that you are one of that numerous tribe that doesn't distinguish /ɛ/ from /ɪ/ before nasals? I had exactly the same reaction when I saw the "Made in China" label on the pen in my mailbox. And yes, interesting choice of colors. I'm not sure even the folks who are into "retro" fashion are ready to bring back late 80s / early 90s neon. So it's not just me! When 70s retro started in the early 90s, a buddy of mine said: "Look, I lived through this junk once already. Can I get a pass out of it this time around?"